Why More Singaporeans Hire part time cleaner? A part time cleaner is like a blue-chip investment that reaps endless rewards; whether you’re a professional, or a full-time mother. Household chores are exhaustive and time can be best spent on love ones instead. When was the last time you have actually pampered yourself? When was the last time you spent time in your passion, hobbies and recreational activities? If your answers go along the line from ‘once in a while’ to ‘never’, now is the time for us to offer you with experienced part-time maid solutions. Escape the mundane, static lifestyle at home; it’s time to indulge! Part-time maids will tend to you at your doorstep, whenever, wherever. Schedule your appointments and spend that quality time with your loved ones. Your schedule, your home preferences, your lifestyle. It’s all customizable and tailored to your needs. Be stress-free. Escape the ‘fixed expenses’ of a full-time domestic maid and reap the rewards of experienced part-time cleaning professionals. Your budget is important to us too. You set the benchmark; we tailor to your requirements. Our part time cleaning professionals represent us. Quality is of utmost importance, and your satisfaction is our mission. Why call us for part-time maid services? Because we have proven track record and tons of testimonials from our client. 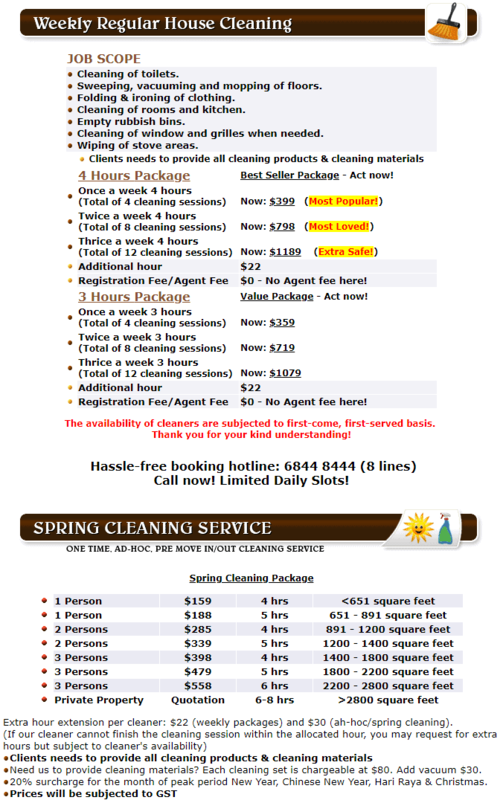 We offer part time cleaner service with absolutely no agent fee! I am moving out from my previous bungalow and i required a one-time cleaning. I was strongly recommended by my friend, their existing customer. Part-time maid cleaner singapore took patience to explain to me the scope of work, number of cleaners and etc. On the actual day, 3 cleaners were at my site cleaning. Their cleaners are professionals, they realised that even with them around, and they are unable to clean up the entire site on-time. They called their supervisor, Ah Poh to inform him that they may need to work overtime due to lack of manpower. He came down in less than 20 minutes and started work immediately without even charging an extra manpower cost. Ah Poh left me a very deep impression, he said in chinse:"We are here to solve your problems and hope to put a smile on your face". Surprisingly, they managed to finish my site on-time cleaning every spot! All i can say, they are professionals and provide high standard of services. Will continue engaging them for my weekly cleaning! Thank you. Excellent customer service to after sale service. Called them and was impressed by their customer service. I decide to try their weekly package after, the cleaner was on time, effective and efficient. She has initiative, doing more than what i excected. Well done guys! I am really satisfied. LEAVE THE JOB TO US! NO AGENT FEE. Where to Find Local Part Time Maid in Singapore? © 2005-2019 House Cleaning Services in Singapore All rights reserved worldwide.